We offer discounted transportation for Blair County individuals aged 60 and older. Our care managers help consumers in Blair County maintain their independence in the comfort of home. Our staff assists eligible older persons and their families with placement assessments for least restrictive living arrangements. Our staff provides crisis intervention services for older adults who may be victims, or potential victims of elder abuse, abandonment, exploitation, or neglect. Our staff advocates for the health, safety, and rights of long term care consumers. Understand Your Medicare, Medicaid, and Long Term Care Benefits. 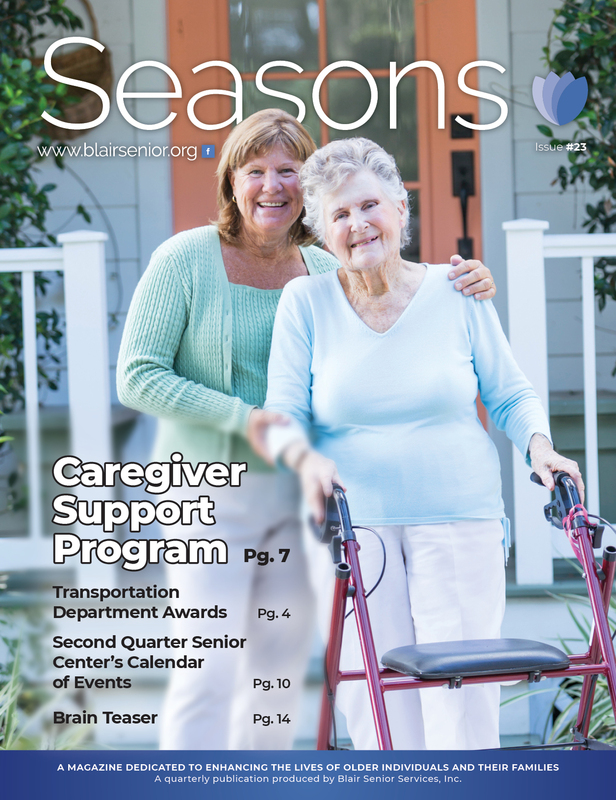 Blair Senior Services, Inc. is committed to enhancing the lives of older individuals, their families and others in need by coordinating and providing support and assistance through a system of quality home and community based programs and services. Our professional staff and volunteers are dedicated to the principles and values of advocacy, empowerment, dignity and respect. Plan your week out ahead of time! Catch any of these great events happening at our Senior Centers this week.